After more than three years, Psych is set to return with a "two-hour holiday miracle." Aka Psych: The Movie. The highly-anticipated TV movie event is set for December 7 on USA Network and now they've released a brand new poster for the movie, reuniting Shawn Spencer and Burton Guster. Here's what Dulé Hill, who returns as Burton "Gus" Guster, had to say about Psych: The Movie. "I first heard about the Psych movie because of our great fans on Twitter. From the time the show ended, the movement had started about getting a Psych movie on the way. So, I was looking forward to what [creator] Steve [Franks] and Roday would come up with next. I knew it was going to be something that was going to be full of hijinks and fun and light drama." It's also been revealed that Psych: The Movie picks up three years after the events of the series finale. The guys have now relocated to San Francisco and, in addition to the central cast returning, there's going to be lots of special guests from throughout the show's run. John Cena as Ewan O'Hara, Ralph Macchio as Logan Phelps, Timothy Omundson as Carlton Lassiter, Maggie Lawson as Juliet O'Hara, Corbin Bernsen as Henry Spencer and Kirsten Nelson as Chief Vick all return for the movie. Hill also says that Zachary Levi, who was recently cast as DC's Shazam, brings something new to the table for the movie. "We have a whole bunch of familiar faces. Pick from any season and you're going to see somebody show up who you've loved over the course of the series. And I know the fans are going to get a thrill out of seeing what Zach Levi brings to the Psych world." James Roday says that he was excited to do the movie, but not so much about writing more material. Roday says, "We kicked back a few beers and he sort of pitched me the whole story. I was like, 'Dude! I am in. How little can I write?'" Though everyone from the cast was sad to see the show go, Roday also reveals that, at the time, it felt like the right thing to do. "There's a lot of the same faces, a lot of the same love ... it's like we never left. I'm gonna be honest, it took me eight years to finally learn everybody's names and then, boom! They pulled the plug on us. So in a way I sort of felt like that was a lot of misplaced energy. Other than that, I felt pretty solid because we'd run out of ideas"
Psych was very successful for USA, having run for 121 episodes. 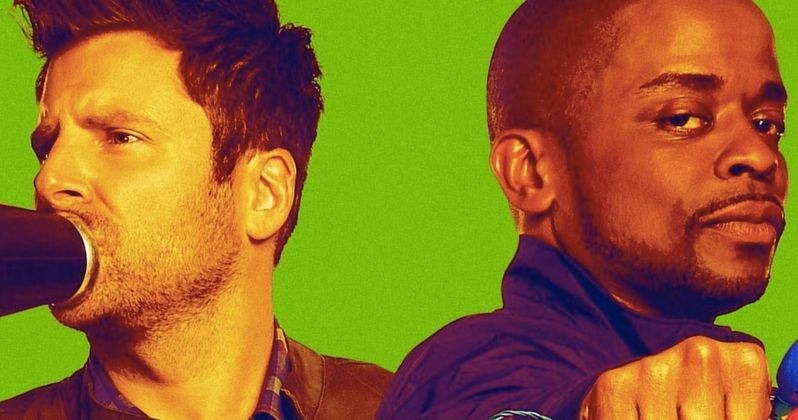 While a full revival series may be a bit much, Psych: The Movie sounds like exactly what fans of the show have been looking for. You can check out the new poster for Psych: The Movie, courtesy of Entertainment Tonight, for yourself below.